We are so happy to get into playing outdoors all day everyday, so we decided start new series on our blog. It’s a challenge our family will take. I will name it FREE PLAY: it’s free to your wallet and it’s free to the kids, meaning I will try direct and suggest and set up as least as possible. Free play encourages creativity, team work, imagination and problem solving. Every day I will give my kids one item to play with. The item will be either something from nature (a rock, wooden stick, water) or a household item (straws, pots, buckets, rope). I will try my best and not interrupt by suggesting what should they play. I am really curious and excited to see what will they come up with. So basically we collected a big pile of rocks from our farm property and talked a little about how to play safely with them. The most important rule was “no throwing rocks”. Then, I sat and watched. With my camera in hands. 1. ROCK JUMPING. Place the rocks in curved line on the ground (preferably grass). Space them out at the size of average child’s step. The activity is to jump from rock to rock (on one feet or both feet) without falling off the rock. It’s a great physical activity that will encourage jumping and improve self coordination. To make it educational you can suggest your children to write lettes or numbers on the rocks and yell them out when one steps on the rock. 2. ROCK MAZE. 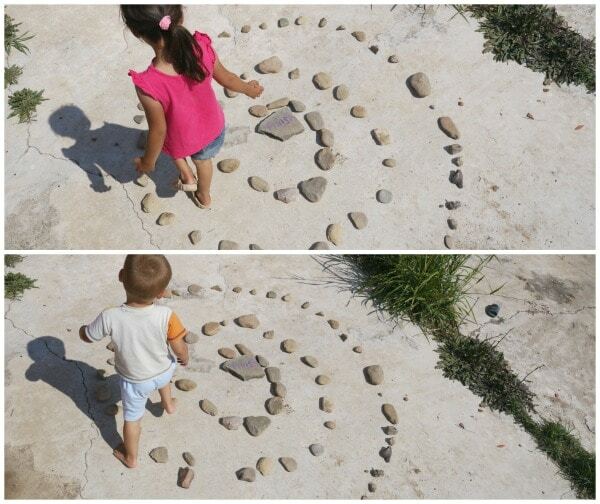 Kids made the maze from rocks. They made a circle shape, but it could be any shape. The bigger the maze the more fun is to play with. My kids tried to jump on feet and get out of the maze, they also tried to go through it with closed eyes. My toddler had the most fun with it. He was going rounds and rounds and couldn’t get out of maze. There were a lot of laughs. 3. ROCK HUNTING. Mark or color the rock, hide it and let the other kids find it. Kids tried to play this game with clues. 4. ROCK ROLLING. Neighbor boy came to visit us today and he showed his favorite rock game. Both kids divided rocks into 2 equal parts. 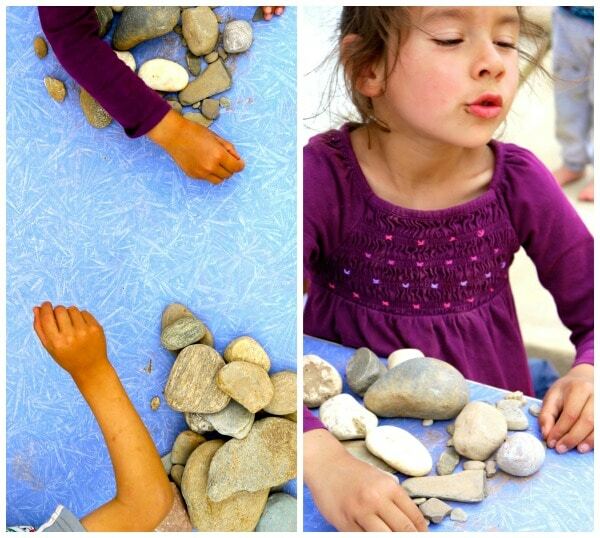 Then put 1 rock in the middle of the table and tried to hit it and move it by rolling other rocks (from their piles) into it. There were more rules of this game but I didn’t get all of them yet. 5. STORYTELLING WITH ROCKS. 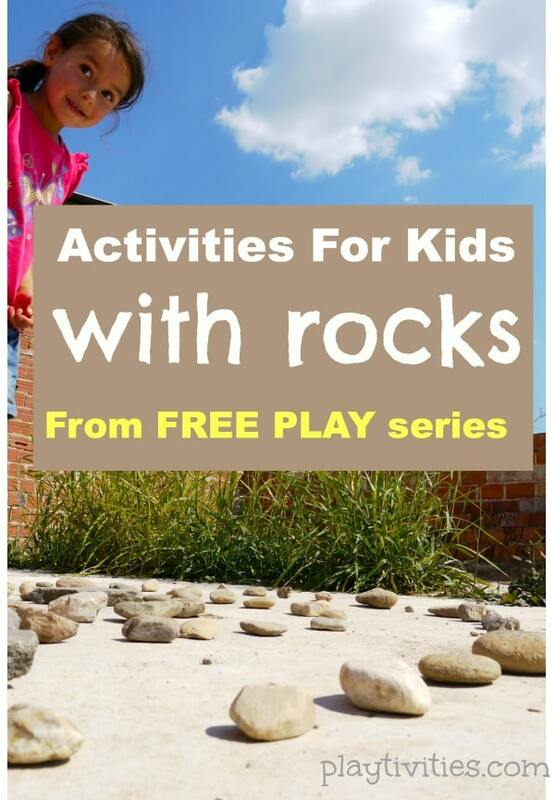 For a more quiet time kids can color the rocks and have a Story Telling Activity. don’t expect kids to play with rocks all day. They may play a game or two and move on to other activity. And that’s OK.
if you see they are loosing interest of they have lack of ideas on what to play, try adding another item to help them with the ideas. Kids had a blast playing and were pretty surprised with how fun and easy was to play with rocks. Mostly, they were amazed by the activities they came up with. Birute, where can we find more Sofia Tube series? Great! Free play is so important for children. I believe it is central to how they learn. Looking forward to the rest of the series. Sharing.